Dyno tune with Riders Choice as we are a Bazzaz Ram-Air Tuning Center. We have the only Ram-Air Dyno that can simulate 240km/h wind speeds for the optimal tune! We can dyno your bike for a performance benchmark, tuning, and even diagnostic of troublesome symptoms. With a history in racing and longstanding career in the motorcycle industry, you can trust that your machine will be handled professionally and efficiently. Do not trust a pre-loaded map, get your Race or Street bike custom tuned for real world conditions today! Please call 905-896-7433 for more details on dyno tuning. Looking to sharpen your skills? Try a Riders Choice Track Day this year! Still need parts or accessories to set up your bike before the fuel management and dyno tuning stage? 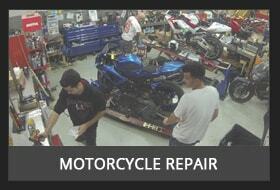 We provide all your needs from race body work, tires, windscreens, to lap timers, bike stands, and tire warmers! We always like to recommend Shell 91 fuel (no ethanol! ), fresh spark plugs, and a clean air filter for the best possible results when running your motorcycle on the dyno. For some applications the stock air filter works best, for others we can supply you with K&N products for reusable & washable air filter elements. We always stock up on NGK spark plugs before riding season so stop by today and get your maintenance kit ready for the spring. Please ensure your motorcycle is clean with no loose parts and with a good condition rear tire for any dyno appointments. Please also ensure it is in good running order and let us know if there are any exceptions we should be aware of.